We're excited to announce today that the latest version of our free data visualization software, Tableau Public 8.1, is now available for download. This newest release builds on our recent efforts to facilitate more sophisticated analysis and to make visualizing data fast, easy and beautiful. Here's the example workbook - can you spot the new features? Take a look and then scroll down for the answer key. Not only is a ranked list created, but Tableau allows the user to configure how to deal with ties. 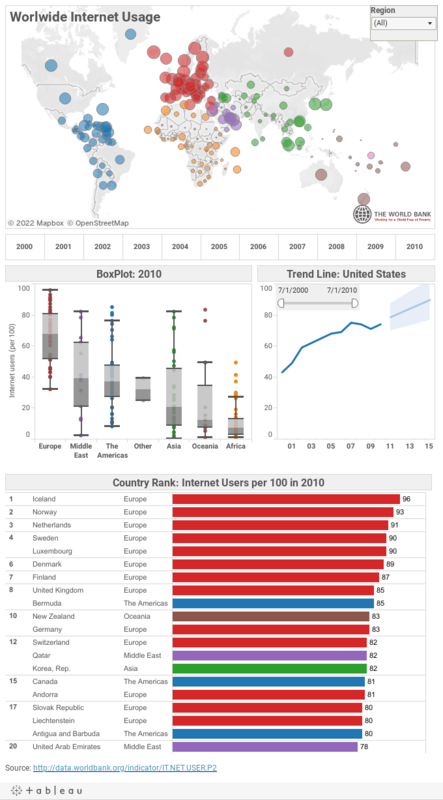 In this case, Sweden and Luxemburg are tied in 4th place with 90 internet users per 100 in 2010, so the next on the list, Denmark, is given the rank number six. Additionally, using Tableau Public 8.1, authors can easily create percentiles, view a dashboard in the application in presentation mode, specify which day a week starts on, arrange fields into folders in the Dimensions and Measures areas, and use the Dateparse function to quickly format messy date formats. As you can see, the intention with this new release is to make it easier to perform more sophisticated analysis, and to make visualizing data fast, easy and beautiful. Be sure to download Tableau Public 8.1 and try it out for yourself. When you create something, be sure to let us know by tweeting us @tableau or emailing us directly at tableaupublic@tableausoftware.com. Let us know your thoughts on these new features by leaving a comment below, and be sure to tweet about your favorite new feature using the hashtag #81FAV. Hello Congratulations on the new release. Is there a 64 Bit version of Tableau Public 8.1 as well? Thank you, and yes, you should be able to download the 64-bit version here. I read that Tableau is now available for Mac… please could you tell me where I can download a copy? Hi, is there an easy way to upgrade from 8.0 to 8.1 ? Is there a menu item somewhere or setting to do it automatically ? thanks for such a great free tool ...! You're welcome! To upgrade, you just need to download and install 8.1. There's no setting currently that will allow you to automatically upgrade. how large is this "corner"
how large is this "corner" that you speak of?